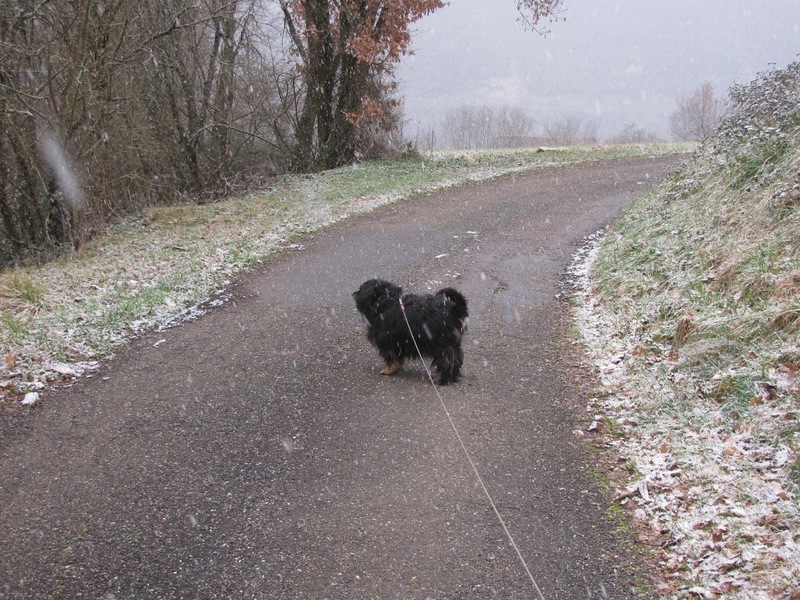 Flocons de neige this morning, but Lucie doesn't mind. 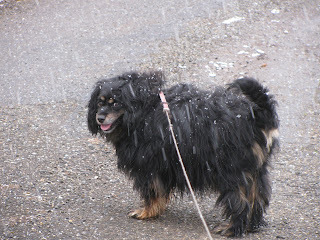 She has more hair than any dog I know, and a little of the white stuff doesn't even faze her. We walked as usual. I emailed my brother yesterday and shared a few French weather words like neige, nuage, vent, pluie(snow, cloud, wind, rain) with him. He remarked on how similar they are to the Spanish words, but that he didn't think he could pronounce the French ones. Heck, these are easy French words! Try the hard ones like ecreuil, feuille, or chevreuil. My American lips just will not pucker up like they need to for these words...kind of like tropical fish do when they 'kiss.' So, I avoid any conversation about squirrels, leaves or deer. It's just easier that way! Flocons de neige is easy, though. You knew I was talking about snowflakes, right?